Aloha, and thank you for checking in on our lives here in Kipahulu, Maui! As last week I had mentioned a future Nursery update, here you have it! First a weekly update on what’s the “haps.” We’ll jump right in! Welcome back Rich and Virginia!!! This week we’ve been all super duper focused and centralized on the organization of our bamboo storage in our Quonset hut. 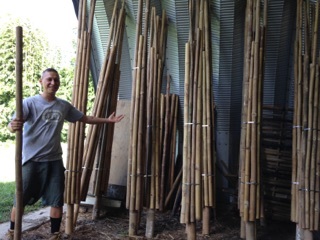 In order to tidy things up, we processed and drilled out the rest of our latest Bamboo Harvest. 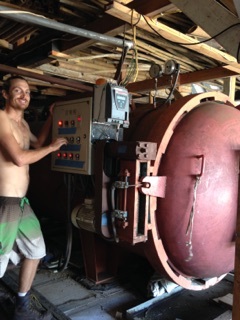 We then ran the pressure vessel and pressure treated a load of the new bamboo, as well as some large mango tree slabs for a local Maui customer. 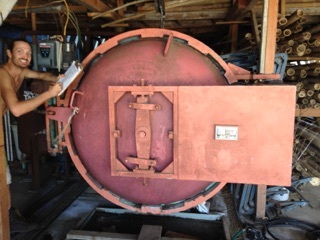 If you have need of any wood pressure treating service on island, give us a call! We would be happy to work with you. Here’s Gabe running a pole on the drill table on the left with the result of the pressure vessel loaded on the right. Here’s James dutifully running the vessel, taking note of all the crucial numbers and readings. Though of course most importantly, looking pretty. As part of our clean-up in the Quonset we took and stacked a large number of leftover poles on a “Rick” that will later be put up in a huge bonfire. 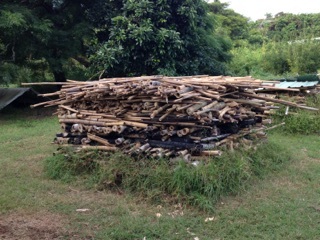 It will be kept at the perfect temperature by using a hose to consistently spray down the pile allowing for bamboo charcoal to be harvested and used in a facet of our Biodynamic lifestyle. 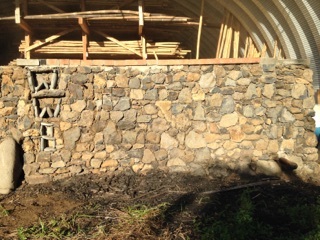 We also will be tearing down our old charcoal oven that is no longer in use taking up space in the back of our Quonset hut to hopefully build a brand new oven for cooking outside of the farmhouse kitchen! It is a plan taken on by some of the crew here. 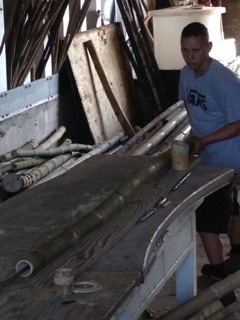 In addition to all of this great work, we have been completing more and more Bamboo Columns! 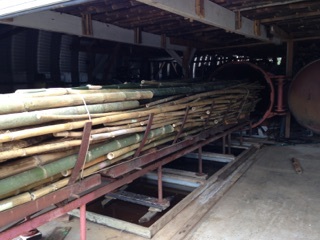 We are nearly a quarter of the way there with our latest bamboo structure project. Progress! Here’s Gabe standing next to some of our work so far! Here is also a picture of the newly cleaned and nice looking Quonset hut. This does a nice job of bringing everyone up to speed here with us! We will be doing an update specifically on our bamboo structures. The structure plans we have available, finished structures, and other necessary information. On to the Nursery! 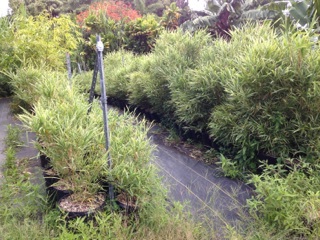 A few hundred feet from the shop and Quonset sits our bamboo nursery. This location receives a heavy amount of focus from all members of our community. This is where we start all of our plants, bamboo or otherwise. We have a large quantity of rare and special bamboos at all stages of life, useful for things you would never have expected. If you would like further information or would like to place an order, everything is available at our site online. 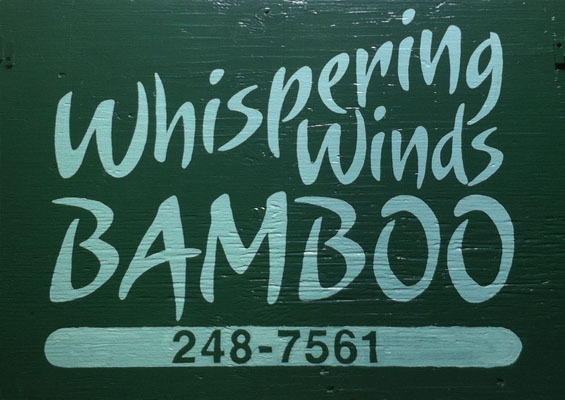 Whisperingwindsbamboo.com. There will also be a phone number to call regarding questions or orders at the bottom of the blog post. This is where the tools live! Getchu’ one! In the above photo potting and storage on the left and tools hanging along the back can be seen. Two different versions of soil are turned and created in the two cement bays seen on the right side. 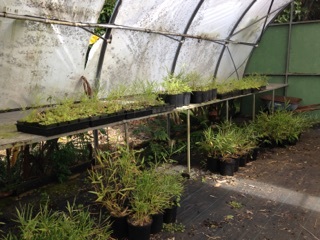 We spend many hours working within the nursery to maintain the quality of life of our many varieties of bamboo species. Each variety having different temperaments and nature of growth. They all respond to this maintenance in unique ways each their own. 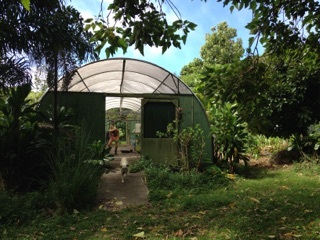 This is our greenhouse with Trevor seen inside and Cino the farm dog coming out. 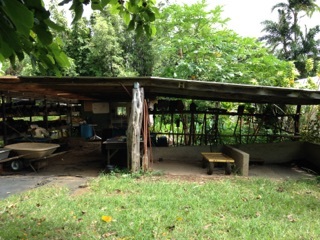 It is a beautiful place easier controlled and houses our very young propagated bamboos, small plant starts for the garden, and sprouted coconuts. Now we’ll take a trip to the left of our greenhouse, to our shade house where the adolescent bamboos and plants are stored! 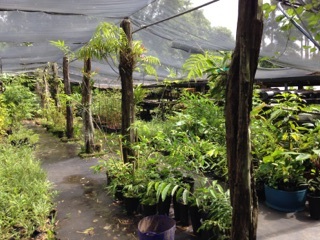 Though these plants are still kept out of direct sunlight through use of shade cloth placed on top of Kiave posts throughout the shadehouse, they still will not thrive in direct sunlight. 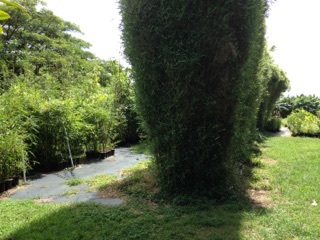 Back in front of the greenhouse, we’ll take a right instead to our mature bamboo hardening off zone. These spaces host the current homes of our more mature bamboos. They range in shape and size, but all are strong enough to maintain direct sunlight and minimal amounts of water. Each plant is still connected with a drip line. 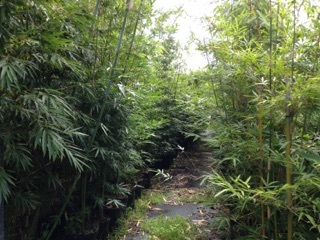 Seen on the left is Malay Dwarf, a popular variety of bamboo we offer. It is said by many to be the perfect hedge. With limited height, a clumped base, and low maintenance required. A mature example can be seen just above next to the previous paragraph. This bamboo is unique due to its height, but also due to it growing with white stripes throughout the normal green color of the Malay variety. 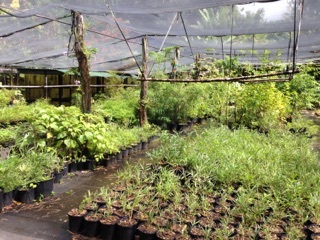 It can get rather dense and forest-like in the more mature parts of our nursery! Each row is around 50 plants in length. 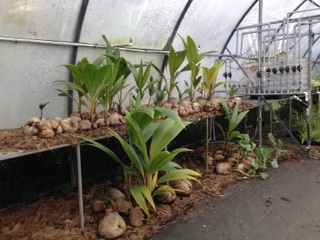 There are around 20 or so rows in the nursery total. We love our growing bamboo! All of the bamboo species we offer are supplied with the utmost care and respect for the environment and the plants. They are organically grown, and biodynamically fertilized. We encourage each customer and provide detailed knowledge and support in any venture. Give us a call or say the word, and we’re there to assist with any questions or supply needed support. 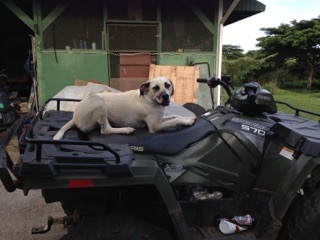 To take us out of the week and wrap it all up so to speak, here’s Cino sitting on Ryan’s quad! He loves to take a ride in any of the motor vehicles. He definitely has a better handle on riding all terrain vehicles than more humans I know do!